Scores of Israeli settlers, during the early hours of Monday, broke into courtyards of al-Aqsa Mosque compound, via the Mughrabi Gate, under heavy protection of Israeli occupation police. 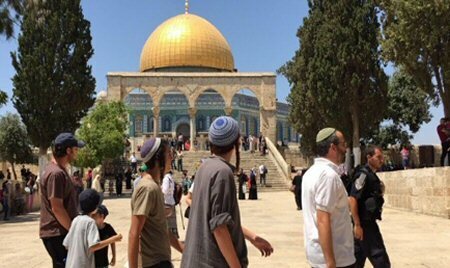 Jerusalemite sources reported that 51 settlers stormed the mosque’s courtyards in groups and carried out provocative tours. The sources added that Muslim devotees, the mosque guards and students who were also present defended it with chanting and hampered the settlers from roaming freely. Al-Aqsa Mosque compound is exposed, on a daily basis, to the storming of the Israeli settlers, as they perform Talmudic rituals and attempt to desecrate its sanctity. The Israeli occupation seeks, through such actions, to devote the temporal and spatial division of the mosque and to Judaize the city of Jerusalem. About 16,000 Israeli settlers stormed Al-Aqsa Mosque since the beginning of this year, and until the beginning of June, an official statistic revealed on Friday, according to Al Ray. A significant increase of these “storm-ins” was observed, having doubled from last year, as 14,000 settlers stormed into Al-Aqsa during the year 2017, according to the channel. About 384 settlers stormed the mosque this week, with an increase of 15%, compared to the same period last year, the channel explained. Israeli Minister of Security Gilad Arad said that a situation of “stability” was responsible for the increase.